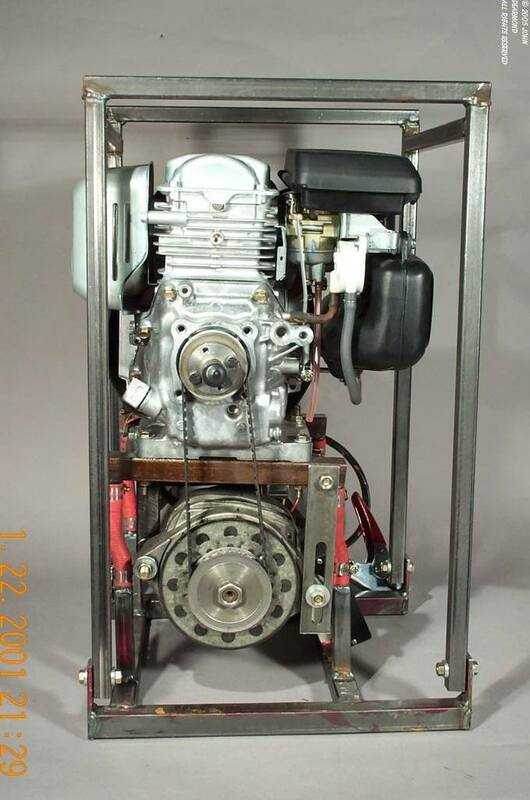 I conceived the idea of a Cordless Battery Charger during my racing days. I watched many racers struggle with portable generators and battery chargers of various sized while trying to recharge their batteries between heats. I realized that there had to be a better way. 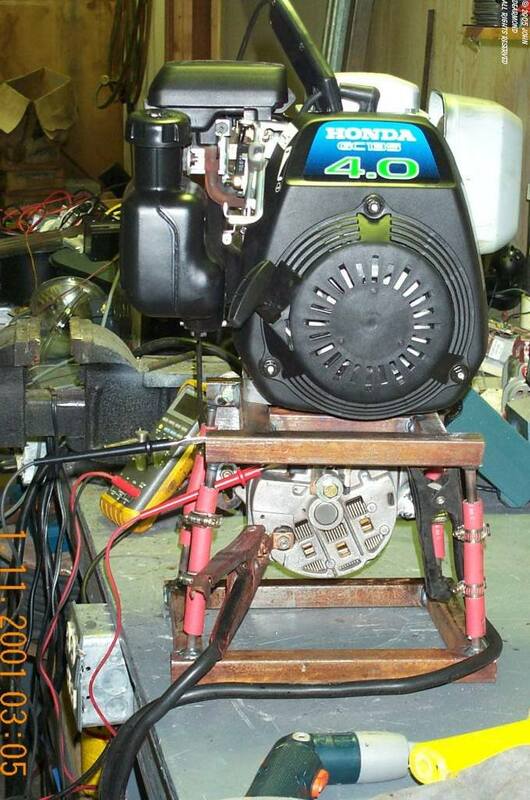 Of course I'm not the first to think of driving a car alternator with a gas engine. But from what I can tell, I'm the first one to do it correctly. 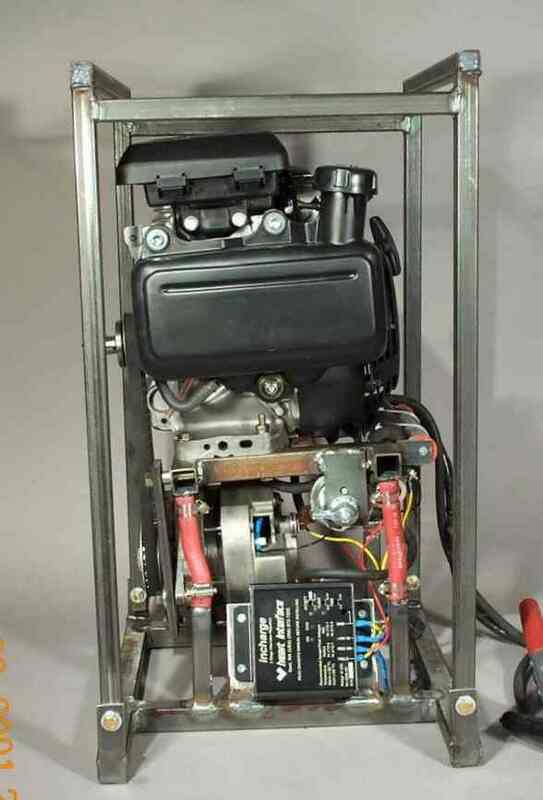 The bulk stage involves feeding the battery with current limited power. 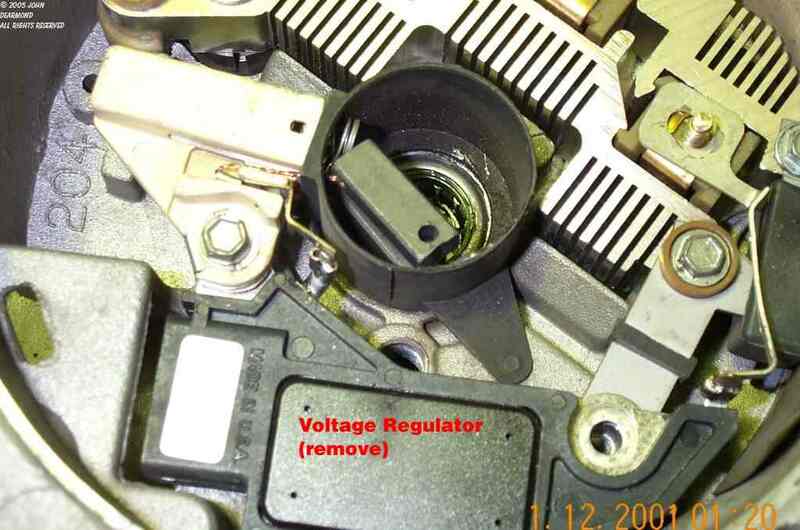 The voltage is whatever the battery terminal voltage is. The current is either limited to a set value or is the maximum the charger can produce. As the battery accepts charge, it's terminal voltage rises. 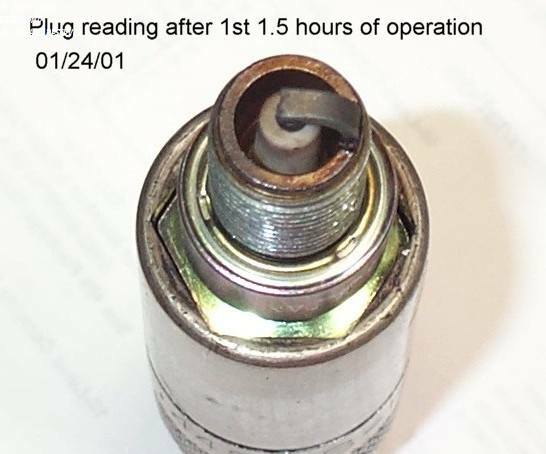 When it reaches a certain voltage that depends on the battery chemistry and temperature, the bulk stage ends. Assuming the charger is capable of 1C or better charging current, this stage lasts only a short while, usually less than an hour. The absorption stage is a constant voltage regime. Constant voltage, in the nominal range of 14.2 volts, is applied to the battery. The current is whatever the battery can accept as it absorbs charge down deep in the plate materials. The current tapers off as the stage progresses. When the current reaches a designated minimum, in my case, 2% of the initial current, the absorption stage is over. This stage lasts from 3-4 hours regardless of the battery size. 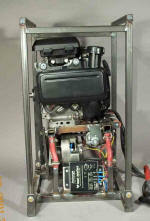 The float stage involves reducing the voltage to just below the gassing point, around 13.8 volts, to finish the charge. This is usually a timed stage but can continue indefinitely if desired. The bulk stage represents from 50-70% of the total charge. The absorption stage represents from about 70% to 90% of the total. The float stage accounts for the rest. In the early 90s I designed my first CBS to implement this charge algorithm by controlling both the field excitation and the throttle. 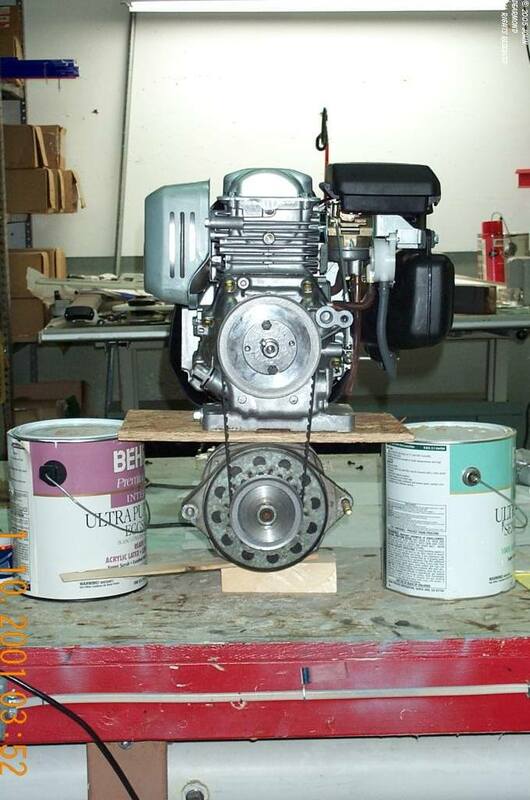 I used a small 2-stroke engine, a small alternator and a home-made control circuit. This CBC would produce 60 amps during the bulk stage and weighed only about 12 lbs. I made a few of these, enough to see that there was a demand. Several things happened that prevented me from commercializing this design. Eventually I put the design on my file server (no web back then, files were served up via email requests.) 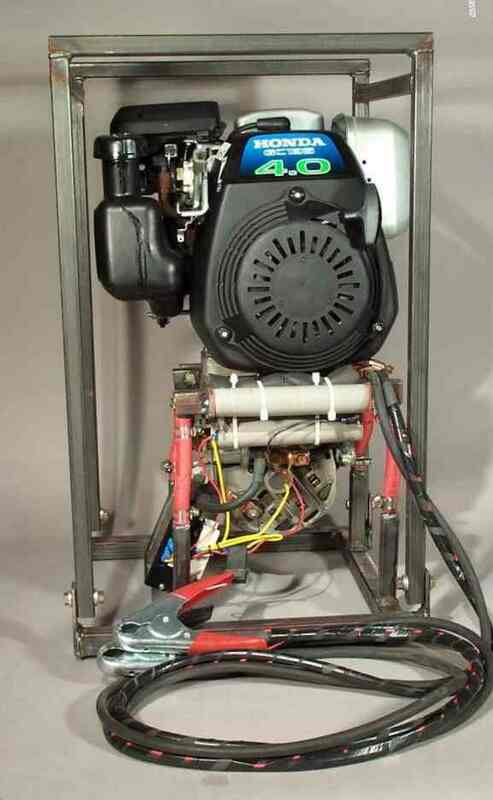 A couple years later Coleman came out with the Mighty Mite combination generator/charger that was an almost exact copy of my design. Did they use mine? Who knows. In about 2000 I bought a motorhome and started camping again. I do not like RV parks or crowds so I generally "dry" camp on unimproved flat spots. Obviously there is no power available. I like my conveniences such as plenty of light, music, etc. That means that a means to recharge the rig's batteries was needed. Enter CBC-II. 150 amp output. House batteries to recharge in a couple of hours. Charge rate varied by engine speed to minimize noise. Auto-shutdown at the end of the charge cycle. Lightweight and man-portable without straining - <35lbs. CBC-II as it stands today meets all those goals except the auto-shutdown. That is coming in the next generation of controls. Following are some photos of the work in progress. Unfortunately this part of my web is incomplete for now. I have not properly kept up with the photography. That will change as the round tuits become available. Meanwhile, enjoy the pix. This photo shows the first generation prototype using a modified Cadillac alternator and a commercially available 3 stage regulator by Heart Interface. This controller controls the alternator by manipulating its field current. The alternator is from a 90s vintage Caddy that had the thin film defroster that required high current. This alternator was designed to supply high current indefinitely. The small red wires taped to the main cables constitute a Kelvin or 4 wire voltage sensing arrangement. The battery voltage at the clamps is transmitted back to the regulator by non-current-carrying wires. This avoids the voltage drop that accompanies >100 amps flowing through the main cables. 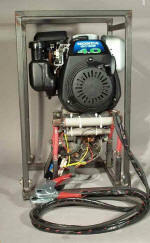 This is a side photo showing the InCharge regulator. Heart was bought out by Xantrex. I'm not sure if this regulator is still available or not. Cruising Equipment makes a superior but more expensive version. 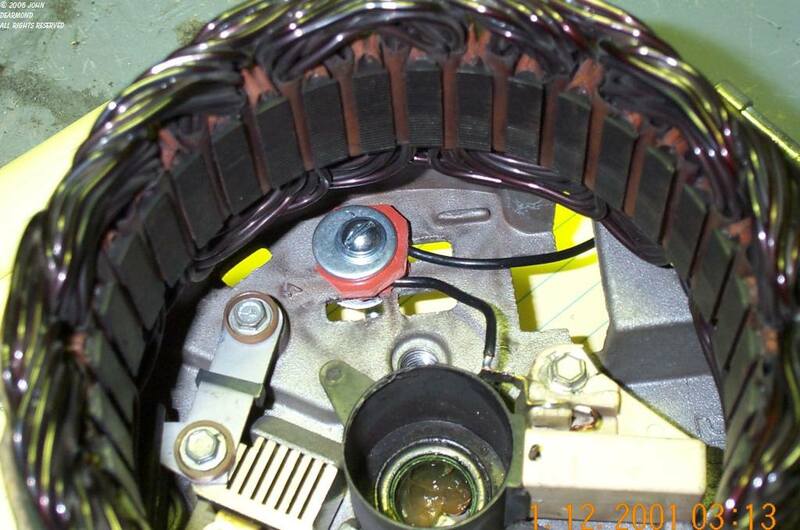 This view shows the timing belt (quiet) and the anti-vibration suspension. I later changed out the red air hose for stiffer hydraulic hose. The alternator pulley is an industrial cog belt pulley that I bored out to fit the alternator shaft. 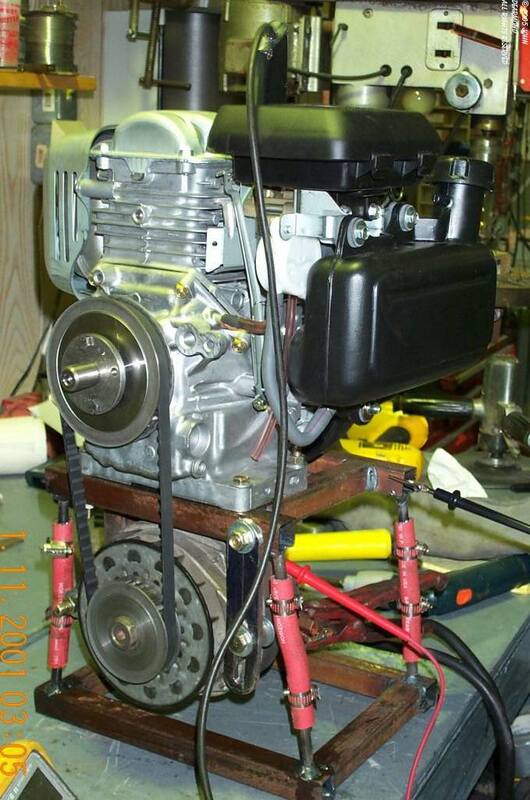 Mocking up the engine and alternator. I chose the Honda GC series engine because it is a belt-driven OHC design that is very quiet. It is also very inexpensive. 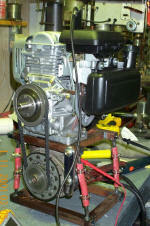 I learned that this engine has a problem throwing the timing belt in cold weather. Honda has a retrofit kit that keeps oil from building up between the belt and pulleys. My solution is to use the 5w20 Mobil 1 synthetic oil. That also gains me about a half horsepower from reduced windage losses. First assembly on the bench, testing the alternator into a dummy load. At this point the alternator is still internally regulated. Experimenting with gear ratios. I wanted to balance the output against noise so I experimented with gear ratios trying to keep the engine speed as low as possible. With my later digital control this step-up ratio worked well but not with the InCharge analog controller. Inside the alternator. The regulator is removed and the field brought out on a wire. Note the housing around the brushes that keeps brush dirt out of the winding. Nice. This shows my technique for bringing out the field. Teflon insulated wire is clamped between red rubber washers. A piece of silicone/fiberglass loam was slid down the wire after this photo to protect the wire from abrading against the case. An absolutely perfect plug. Note the "golden ring" forming at the base of the insulator. This indicates a perfect mix.